This page is about the Eden Project, located near St. Austell in Cornwall, England. You can click here to see a page with more, different pictures about my visit. The Eden Project is run by Tim Smit (of Lost Gardens of Heligan fame), who successfully raised money to build the world's largest greenhouse. It aims to put on one site the complete range of natural plant habitats found on the Earth. Costing around £74 million, it is one of the most impressive of Britain's millennium ventures. The Millennium Commission has agreed a £37 million grant for the venture, the European Regional Development fund £10 million, Private Sector funds £17 million and the balance of £10 million from a number of other grants. It opened Easter 2001. The aim is to attract 750,000 visitors a year and provide a world-class centre for research into the environment. The site is a Cornish clay-pit about a mile north of the road between Lostwithiel and St Austell. It is called Bodelva. With the emphasis in botany moving towards conservation, existing glasshouses are not large enough to allow the study of populations of plants, rather than individual species. This study of populations is important in gaining understanding of sustainable development and plant bio-diversity. 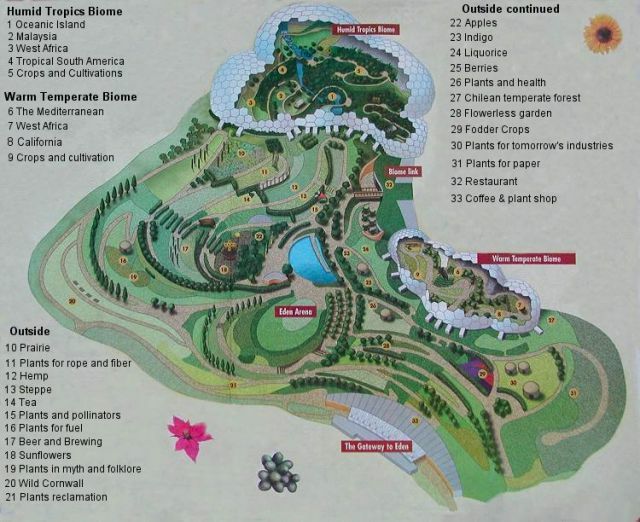 The 'home' of the Eden Project is a dramatic global garden, the size of 30 football pitches, based in the natural theatre of a china clay pit overlooking St Austell Bay in Cornwall. The £75 million project will, by virtue of the nature and delivery of its message, its scale and unique setting, become a visitor attraction of international stature. The Eden Project presents a breathtaking scene, the world in microcosm - a cultural melting pot of global plants, both wild and cultivated. The 60 metre deep crater contains thousands of important and beautiful plants from our own temperate zone, the humid tropics and the warm temperate regions of the world. The two latter climatic zones are housed in giant conservatories known as Biomes. The grounds also contain classrooms, exhibition and conference facilities and assorted catering and retail facilities. The landscaped grounds cover 12 hectares wrapped around a central lake displaying and interpreting plants from our own temperate climate, telling the stories of the crops that have changed our world. Curved around the south facing wall of the pit is the remarkable Humid Tropic Biome - big enough to house The Tower of London, it contains plants from Amazonia, West Africa, Malaysia and Oceania. From rubber to cocoa, and from vanilla orchids to bamboo. Imagine the scale of this place, where teak and mahogany will have enough room to reach their full potential, and where you're able to experience some of the world's most dramatic tropical flora. The Warm Temperate Biome transports you to California, Southern Africa and the Mediterranean. Where you find orange groves, olives, grapevines and hundreds of colourful flowers. Productive plants and natural beauty all under one roof. 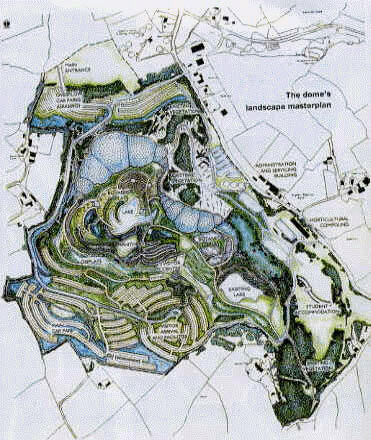 The vastness of the scheme is illustrated by showing that the equivalent of 13 Cathedrals can be fitted into just one of the four plant houses. In the clay pit there are 8 hectares of linked, climate controlled transparent biomes. The brief was to create a spectacular theatre in which to tell the story of human dependence on plants. The team found a disused china clay pit, over 60 metres deep and the size of 35 football pitches, which was sheltered, south-facing and spectacular. 'An architect would fall over backwards wanting to build something in it,' said David Kirkland of Nicholas Grimshaw & Partners. Jerry O'Leary, Works Manager, called it the biggest sand pit in the world. The bad news: it was an inverted cone shape with little level ground, unstable, prone to flooding, and contained no soil. The level of the bottom was raised 17 to 20 metres by slicing off the tops of the spoil heaps surrounding the pit. Twelve dumper trucks and eight bulldozers shifted 1.8 million tonnes of dirt in six months. Then, near-disaster: 43 million gallons of water (approx. 163 million litres) rained into the pit in three months. Our engineers came up with the drainage system to end all drainage systems. It can easily handle the 22 litres/sec of water that runs into the pit (that’s 20,000 bathfuls a day). Dodgy slopes were shaved back to a safe angle and terraces chopped out. Two thousand rock anchors, some up to 11 metres long, were driven into the pit sides to stabilise them, and a 'soup' of plant seed and plant food sprayed on the slopes to knit the surface together. 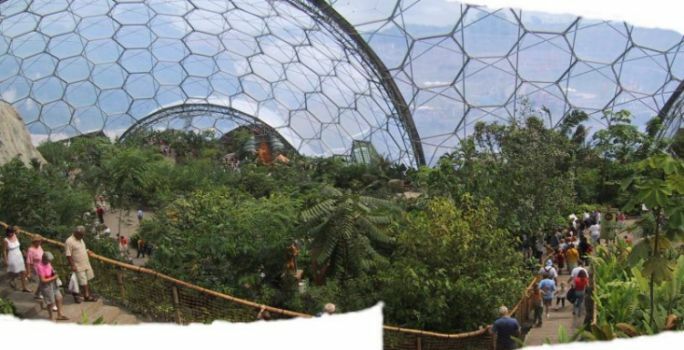 The Biomes are the biggest conservatories in the world, beautiful, iconic and sustainable. The Humid Tropics Biome, which could hold the Tower of London, is 11 double-decker buses high and 24 long, with no internal supports. It made the Guinness Book of Records for the largest free-standing scaffold ever built - 12 levels, 25 metres across, with 46,000 poles, which laid end to end would stretch 230 miles. Building a lean-to greenhouse on an uneven surface that changed shape was tricky. Bubbles were used as they can settle perfectly on to any shaped surface. The bubbles were made of hexagons, copying insects' eyes and honeycombs. This commonsense nature produces maximum effect with minimum resources. The Biomes' steelwork weighs only slightly more than the air they contain. They are more likely to blow away than blow down, so they are anchored into the foundations with steel ground anchors: 12-metre tent pegs! The final design comprised a two-layer steel curved space frame, the hex-tri-hex, with an outer layer of hexagons (the largest 11 metres across), plus the occasional pentagon, and an inner layer of hexagons and triangles (resembling huge stars) all bolted together like a giant Meccano kit. Each component was individually numbered, fitting into its own spot in the structure and nowhere else. The transparent foil 'windows', made of 3 layers of ETFE (ethylenetetrafluoroethylene-copolymer), form inflated 2-metre-deep pillows. ETFE has a lifespan of over 25 years, transmits UV light, is non-stick, self-cleaning and weighs less than 1% of the equivalent area of glass. It’s also tough: a hexagon can take the weight of a rugby team! The pillows were installed by 22 professional abseilers - the sky monkeys. Whilst driving round the china clay quarry landscape around St Austell, Tim Smit conceives an idea of building the world's largest greenhouse. Building work on the Eden Project gets underway. Rain stops play, and work at the site is suspended. The bulldozers and dumper trucks are back in action and work flat out for six months to clear the site. Phase One - The Gateway to Eden - opens to the public. Between now and January 2001, half a million visitors will come to watch the Big Build. The first trees are planted in the Humid Tropics Biome. Phase One closes so that the final construction work can be completed on the link building, and modifications made to the visitor centre. The Eden Project opens fully to the public. Millionth Visitor passes through the gates of Eden. A Visitors' Centre provides a gateway to the biomes and the temperate parkland surrounding. Over time, visitors will experience the world of plants - using micro and time-lapse photography. They will embark on a journey through the veins of plants, taking in the cycle of life and death, regeneration and decay. See the miracle that is photosynthesis - the key to life on earth. Initially, the Biomes encapsulate 4 key climatic regions: rainforest, semi-desert, sub-tropics and Mediterranean. These host not only the greatest bio-diversity, but also the widest range of plants used by man. The scheme is the world's largest environmentally controlled glass-house, containing a databank of all major plant species across the globe. The project uses the latest technology and materials to create a dramatic centre into a modern rival of the great glass and iron structures of the 19th century. Its range of interest has an almost universal appeal from the most esoteric scientist to a child of six.